Get Rich Focusing On The Big And The SmallEliminate The Muda! Venturing into the world of blogging has brought me new insights and perspectives. For example; Ramit Sethi on IWillTeachYouToBeRich.com challenges you to take action and shares a different view on money and finance. As I mentioned, I hate frugality and all the frugality sites that waste my time focusing on saving money on frozen orange juice and rice cakes so I can save $1 per week. $1? I find that much money in my shoe every day. I’m not trying to save $1 or even $10 per week, because it’s not worth changing your behavior for that kind of money. Guys, we’re aiming to save $1,000 in 30 days. That’s why this series will not include retarded suggestions like “Start a garden” or “Buy day-old food from bakeries.” I certainly won’t tell you to cut your rent or move to a cheaper place, because NOBODY WILL DO IT! Does anyone ever follow those stupid tips? No, but it sure makes other personal-finance authors feel good about themselves for coming up with a suggestion that theoretically, maybe, somehow could save money for the moron who would do it. Not here. Ramit is not the only financial blogger who has this perspective but he tends to be the most vocal. There is no doubt that Ramit will help you save and save big, but I cannot help but wonder how much Ramit leaves behind because he is unwilling to open his eyes to the potential in frugality. Contrary to some bloggers opinions, being frugal is not about serious alterations to one’s lifestyle. It is not about sacrificing everything that makes you happy. Being frugal by definition is: economical in use or expenditure; prudently saving or sparing; not wasteful. Take for a moment Ramits comments about saving $1 or $10 per week. If you could just save $1 per week that adds up to $1562 over 30 years and that’s if you simply stuffed it in a mattress. Invest it at a miserly rate of 7% and you have over $5,000. $10 per week gains you $15620 or over $53,000 in 30 years. It seems to me, Ramit undermines his own “anti-frugal” position when he gives suggestions such as Buy Generic For Stuff You Don’t Care About and Turn Your Thermostat Down 3 Degrees. Both are great suggestions and both great examples of being frugal. Being frugal is really more about awareness than it is about sacrifice. When you are blind to an opportunity to are certain to miss it. Once you see the light, once you have an intrinsic desire frugality is easy and natural. A) Something that everyone can implement. B) Something that is S.M.A.R.T (Specific, Measurable, Atrainable, Realistic, Time Based) In this case, time based means you can implement it now. How much more mundane can you get then brushing your teeth? This is something that everyone does, hopefully. Whenever you watch the TV commercials of people getting ready to brush your teeth you see them lay a bead of toothpaste across the brush. You really don’t need this much and in fact may actually be doing more harm than good by using excessive amounts of toothpaste. Patients who abuse toothpaste typically dislike the color of their teeth. These individuals mistakenly believe that the more they brush their teeth, the whiter they will become. Actually, the opposite occurs; as the enamel becomes thinner, the dentine is closer to the surface, resulting in a darker overall appearance, which, encourages more brushing. Truly, you only need about a pea sized dab of toothpaste on a brush. What is the financial impact of avoiding the excess? A typical tube of toothpaste has 6.2 oz of toothpaste. 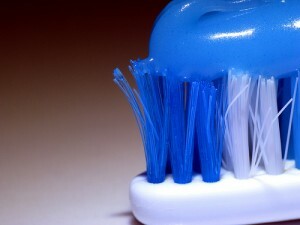 Brushing twice each day a tube of toothpaste should last about 22 days. Roughly speaking to cover the bristles of a toothbrush is equivalent to 3 large pea sized dabs, meaning that you should get about 66 days. Looking at a year of use that means the conventional approach would require nearly 16 tubes of toothpaste while the appropriate and frugal approach would use about 5.5 tubes. Recently I found the price of toothpaste to average $5.98 per tube. The total annual difference is $62.79, added up over 30 year’s time with a meager 7% interest that is over $6,000! $6,000 with toothpaste! And how many more consumables are there that you can also save pennies and dollars with? You can buy generics for stuff you don’t care about, you can turn down the thermostat 3 degrees, you can prepare a little less each night for dinner, you can wear a jacket one more season, you can pack a lunch a few days each week, avoid the coffee shop on the other days, sew your own clothes, repair your own plumbing and mow your own lawn. Many bloggers like to focus on the opportunity to increase your income; they see this as being the easiest and fastest way to increase wealth. But they are tripping over dollars to pick up the quarters. Saving money is always easier and more profitable than making money! Really good points Greg. Two sides to the wealth equation, and I’d rather focusing on making BIG BUCKS than just saving a dollar here and there. BTW, what are your thoughts on Ramit? Do you find it ironic that when he wasn’t rich at 24, he was telling people how to be rich?